When Bruce Meyers developed the original Myers Manx for desert racing, he used a VW engine and chassis – now Volkswagen is said to be considering its own version, an electric dune buggy. The company is developing a concept dune buggy for its I.D. line of battery-electric vehicles, according to a report in industry journal Wards Automotive. Wards said the electric dune buggy is under “active consideration” for production development. This isn’t the first dune buggy concept VW has toyed with. In 2011, for example, the automaker showed the Buggy UP concept, which used a gas engine. The latest buggy concept uses the powertrain VW developed for the I.D. battery-electric hatchback that launches as a production vehicle in Europe in late 2019. It also uses the platform Volkswagen developed for its electric vehicle lineup, according to the Wards report. VW introduced the I.D. unit last year and so far has green-lighted three vehicles: the I.D. hatchback, the I.D. Buzz van – a modern all-electric version of the classic VW microbus – and the I.D. Crozz crossover. The U.S. is likely to see the Crozz in 2020 and the Buzz by 2022. An ID sedan may be in the works for 2012. The hatchback isn’t slated for the U.S. The two-seat, open-wheel, soft-top electric dune buggy is one of three retro-themed concepts being developed with an eye toward expanding the line with vehicles that would make an impact in the market and be relatively easy to sell despite – or perhaps because of – their all-electric powertrains. A modern Meyers Manx/Meyers Manx Inc. The original Meyers Manx quickly evolved from a desert race vehicle to an all-around fun car usable just about anywhere the weather permitted. 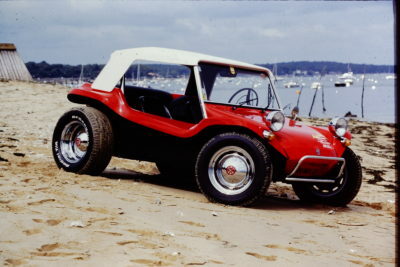 The Manx was launched as a VW-based kit car in 1964. The original California-based B.F Meyers & Co. closed in 1971 but was re-formed in 2000 as Meyers Manx Inc., selling everything from logo-bearing hats and t-shirts to a variety of Manx body kits and complete rolling chassis configured for rear-mounted engines.